Every so often there comes a musical that you know will begin to alter the face of musical theater. A show that others will try and try to recreate in order to cash in on its success. A show that when you walk out of the theater, you know you will be seeing theaters and schools all over the country producing that work for years to come. The newest to be added to that list is Ryan Scott Oliver and Hunter Foster’s Jasper in Deadland. 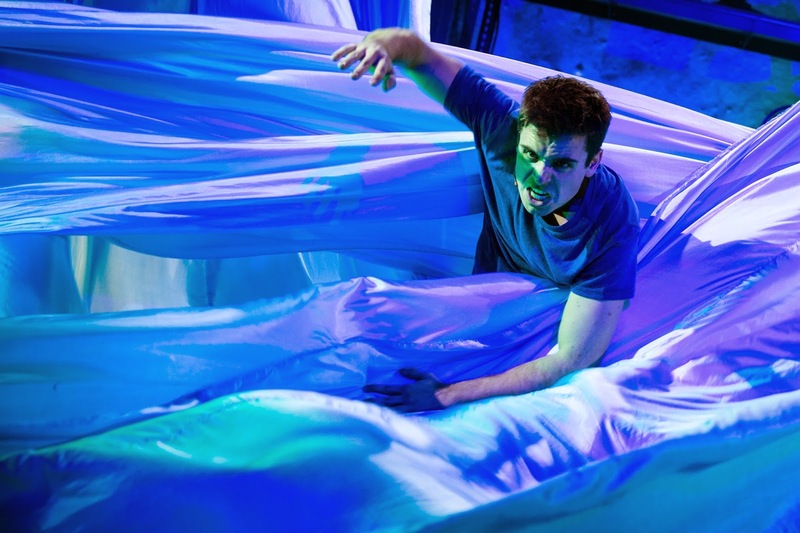 Presented by Prospect Theater Company, Jasper in Deadland follows sixteen-year-old Jasper who journeys to the underworld to save his best friend Agnes. On his Orpheus-like journey, he encounters an assortment of wild character drawing inspiration from afterlife mythology, ranging from Greek to Norse, and discovers the true meaning of life and love. Jasper, a wiser than his years teen, begins the show like every normal kid, dealing with the woes of high school, the issues at home, and blurred lines of love. When he gets wind that his best friend Agnes dove off a cliff to conquer a fear, Jasper rushes to the scene only to find he’s too late. He takes a dive himself which leads him to Deadland which we learn is an afterlife like no other. On our way we meet characters including Mr. Lethe, a business tycoon attempting to take control of Deadland and stop the hope Jasper has brought, Cerberus the philosophical three headed dog, Hel and Loki, the opera inspired Norse gods, and Pluto and Persophone, the rulers of Deadland. Oh, and of course a young girl named Gretchen, who has a significant secret of her own that you probably saw coming but still gasped when it was revealed. Jasper and Gretchen are a perfect pair, for an assortment of reasons that would contain too many spoilers, but they balance each other harmoniously. For a musical to be special, it needs to have a memorable score. Ryan Scott Oliver has that covered. Oliver, who wrote both the music and lyrics, has a way with words and the great ability to get the audiences toes tapping. The book by Ryan Scott Oliver and Hunter Foster was, for the most part consistent. Laden with pop culture sprinkles brought laughs, but it was their larger than life characters, expertly crafted by the ensemble, that allowed for the hearty laughs. In a piece where the creators established the world, the rules set forth were pretty accessible and sensible, however there were a few reveals that contradicted previous rules. But with an A+ cast and a rockin' score, you tend to forgive. If there was one momentum crusher, it was the flashback scene at the top of Act II. All it provided was a set up, one that could have been executed in the present. To give the musical life, Jasper in Deadland collected a multi-talented cast, each with their own shining moments. Led by Matt Doyle and Allison Scagliotti, there wasn’t a flaw within the cast. Matt Doyle's smooth and effortless vocals and ability to command the stage proves why he is a rising star and the future of musical theater. Allison Scagliotti's beautifully unique voice were superb but it was her quick tongue wit and excellence in timing that defined her stellar performance. Rounding out the ensemble with strong performances from Andi Alhadeff and her various whacky character antics, Leo Ash Even’s stellar comedy, and Bonnie Milligan and F. Michael Haynie as the show-stopping Hel and Loki respectively, the latter getting extra props for the sadistically funny "The Chuckster". Director Brandon Ivie does a wondrous job bringing the rock musical to life. Tackling a journey play can be hard, but Ivie seems at ease. From stunning stage pictures and inventive ideas, Ivie puts a stamp on the production. Ivie's masterful work brought cohesiveness to the world. Expect to see more from him. Lighting designer Herrick Goldman and scenic designer Patrick Rizzotti transformed the Church space to create the memory filled underworld flawlessly, though I wished the props on the shelves had a little more relationship to the characters on stage as opposed to creating shadows and filling negative space. Bobby Pearce’s costumes were big and perfect to invent these big characters. The only part of the creative team that seemed to not connect with the rest of the production was the choreography by Lorin Latarro. In a time where contemporary dance seems to be the trend in rock musicals, the static nature of the movement and the inconsistency in storytelling occasionally drew too much attention in a negative way. As Jasper in Deadland is sure to get new life in bigger budget venues, the production will soar to new heights. But to be this solid at this point in time is scary. If you don’t have your tickets to Jasper in Deadland, you will kick yourself that you didn’t get the an opportunity to see it in this incarnation. But fear not, Jasper will live a long time.